In a political environment where debt is bad and balanced budgets are good, governments find it difficult to fund infrastructure. Infrastructure funding is left to financial instruments such as private, public partnerships (PPPs) and long term loans where governments take the risk and private corporations take the profits. At the same time Australians are saving more through compulsory superannuation but have limited investment options for those funds. The government’s ASIC website offers the advice to invest in Shares, Property of Cash. Unfortunately there is no direct way that citizens can invest in infrastructure for their own communities. However, we know that infrastructure increases the wealth of a community. We know that over the years the NBN will return more value than it costs. We know that education of children and adults increases the wealth of a society. We know that building freeways opens up more land for development and we know that public transport allows us to increase the density of cities and so increase the value of land. What is needed are ways for ordinary citizens and taxpayers to have the opportunity of investing their savings directly in the infrastructure they use. Wikipedia says Crowdfunding is the collection of finance from backers—the “crowd”—to fund an initiative and usually occurs on Internet platforms. Another way of looking at Crowdfunding is that people make Pre-Payments for products and services. We can use this idea to fund community infrastructure by allowing individuals to prepay the increase in value obtained from the infrastructure constructed. In the past infrastructure was financed by the issuing of government bonds. The bonds were paid back from the taxes and fees collected from the communities who used the infrastructure. Nowadays infrastructure is financed by banks creating loans which are then used by communities to fund infrastructure. The loans plus interest are repaid from taxes and fees collected from the communities who use the infrastructure. Pre-Payments can be turned into investments by giving the purchasers of Pre-Payments some value depending on when they use the goods and services. One way to do this is to give a discount to the buyer depending on the length of time before the Pre-Payment is used. To turn Pre-Payments into investments they need to be transferrable. A Pre-Payment along with the Discount it has earned needs to be transferrable to another party who can then use the Pre-Payment to purchase the goods and services. We can give Discounts as a percentage depending on how long the Pre-Payment is held. Let us assume a Discount Rate of 5% per year and an investment of $100. At the end of the first year $100 will purchase $105 worth of goods. At the end of the second year $100 will purchase $110 worth of goods. Because the goods and services produced by infrastructure will rise with inflation we can adjust the $100 to account for inflation and still be financially prudent. 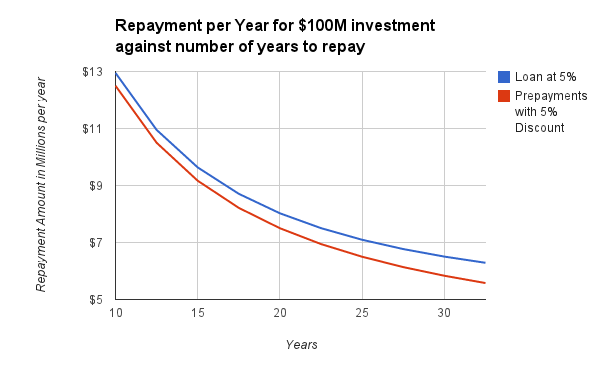 The following graph shows the Repayment Costs to the Community of a $100M loan versus Discounted Pre-Payments. In all cases for the same discount rate and interest rate the cost is always less. After 30 years the savings are $67M on $100M investment between discounts and interest of 5%. With a Discount and interest of 7% the savings are $123M. This happens because with loans interest is paid on interest. All communities have some form of taxes. The Pre-Payments for community infrastructure can be used to pay taxes as well as output from the infrastructure. This means that there will always be a demand for Pre-Payments and that means investments in Pre-Payments are liquid. Because the Pre-Payments are used to pay taxes the investment is as secure as the community paying the taxes. Pre-Payments can be any size and can be for any length of time. This gives investors flexibility along with a known return. As taxes almost always rise with inflation Pre-Payments can also be allowed to rise with inflation. If a Pre-Payment with a Discount is sold to another party the value of the Discount is treated as a Capital Gain. If the Pre-Payment is used there is no tax paid on Discount value. Pre-Payments are an attractive investment and should be first offered to those who have to pay the taxes. Per-Payments give governments a way of monitoring the effectiveness of investments without hypothecation. Internally the increase in value to the community and the government can be monitored because the government knows how much was spent and can measure increases in value such as sales of land, or water, increases in taxes, and value of medical services created from the investments. CrowdFunding from taxpayers for infrastructure provides a politically attractive way for any community that levies taxes to invest for the future. Taxpayers are able to directly invest in infrastructure built for their community and get a return on their investment. Pre-Payments with Discounts prevent governments going into debt to build infrastructure. They provide a stable inflation adjusted return and can be used for any form of infrastructure that a community wishes to build. This can include hospitals, schools, freeways, public transport, water and sewerage and renewable energy. Governments can pay back existing loans through selling Pre-Payments. This will eliminate interest payments so reducing deficits while giving taxpayers an investment in their own communities. 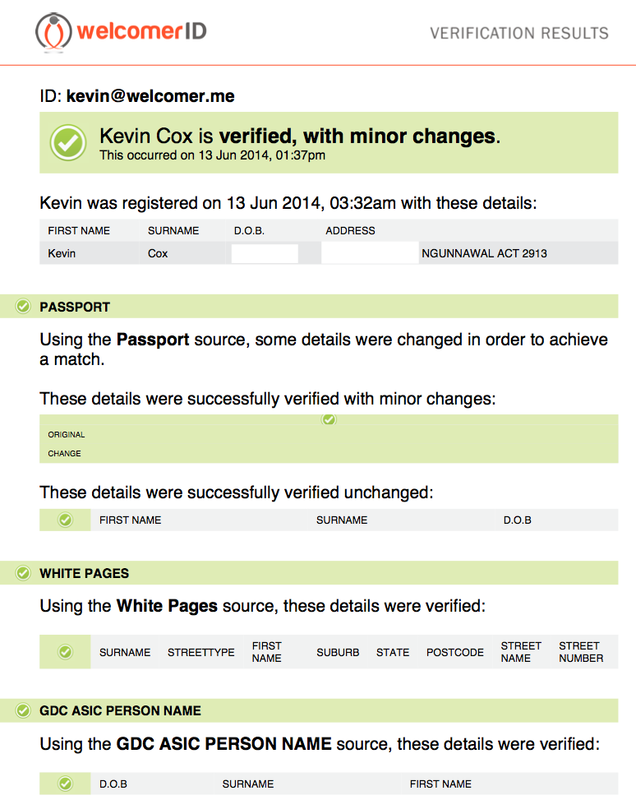 to allow a person to verify themselves to the organisation. Once a person has been verified an email is sent to the organisation telling that the person has been verified and how they were verified. The following is an example of the email that is received. Here the date of birth and street address have been blanked out.